Where you can talk to damp people. 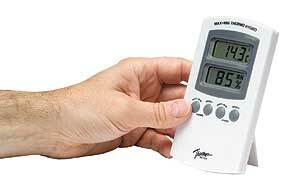 How do Damp Meters Work? 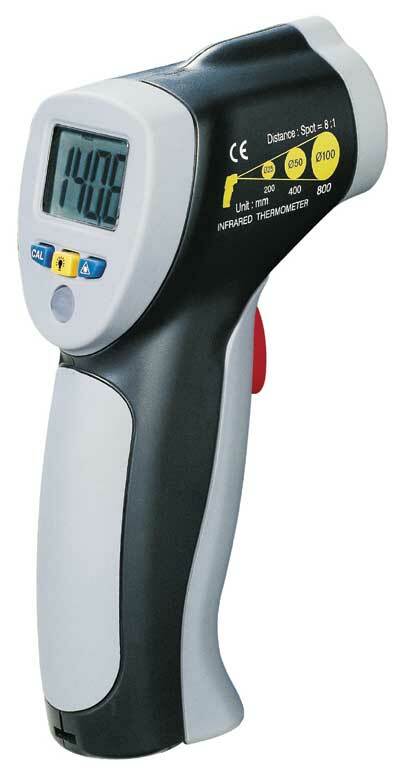 Damp testing meters measure either electrical conductivity between two steel pins touched onto, or pressed into the plaster, masonry or timber, or they use a smooth contact head to measure electrical capacitance. Damp meters usually have two scales, one for timber and one for masonry, but some have only a simple 'reference' scale or a row of coloured lights. Dampness readings in wood usually covers a scale from 0 - 40% maximum (average softwoods are saturated at 28% - 32%) and damp readings in masonry (brick, stone, plaster, concrete) usually range from 0 - 5% maximum. 'Protimeter' is the trade name most familiar to the professional surveyor, but there are many other quality 'damp' meters on the market. Protimeters tend to be expensive, but have a range of special attachments and advanced features required by qualified dampness Surveyors and Chartered Building Surveyors. 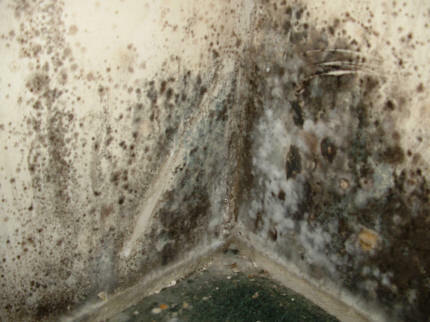 Test the walls of the building with our Condensation Test Kit and look for evidence of mold - usually 'black spot' - this indicates that you have Condensation forming on the coldest surfaces in the room. Unless you can increase ventilation and heating, consider using our Anti-Mold Paint Additive or Anti-Mould Emulsion Paint - guaranteed for 5 years! If necessary, treat all plaster with the anti-mold treatment supplied with the paint and then redecorate. 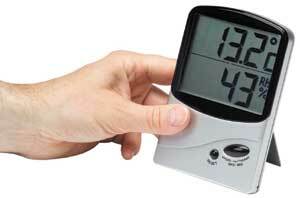 Measure the Relative Humidity - use our Hygrometer to monitor the conditions in each affected room and use the Memory function to check the exact conditions overnight, the time when temperature falls and condensation is most likely. This meter helps you to control the conditions that cause condensation and to monitor the use of your heating, ventilation and dehumidification. Firstly, check the outside of the building for rainwater penetration - if the walls are absorbing moisture apply a water repellent - UltraProof - check your downpipes and gutters. Damp testing meter - a sturdy conductivity meter, ideal for testing masonry (brick, stone, plaster) and timber (skirting boards, floors) to give an indication of 'relative' dampness. Always use meters to compare like materials, never to give absolute moisture readings. 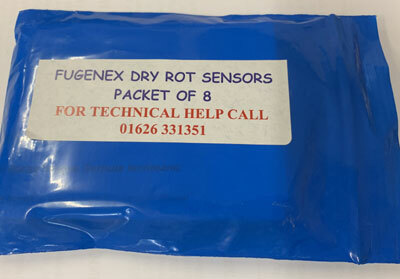 Can also be used to test damp floors and new concrete floors. Wall temperature gun - the best way to quickly find the cold areas in a building. Compare readings for areas showing no signs of damage and see immediately the extent of the cold - point and click. 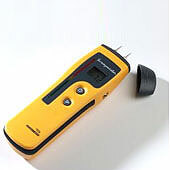 Can also be used to test damp floors and concrete floors to locate cold spots, more likely to be the leakage area. Protimeter Mini - The Protimeter Mini can be used for making rapid moisture assessments in a wide range of building materials including wood, masonry, drywall, plaster and concrete. The instrument measuring pins are small and sharp which means measurements can be taken at the surface with virtually no mark left behind. When taking readings in awkward positions, the Protimeter Mini can be used with the moisture probe and lead, supplied as standard with the instrument. The optional Protimeter Hammer Electrode can also be used with the Protimeter Mini for determining moisture gradients in wood. The current Surveymaster incorporates two modes of operation - search and measure (non-invasive and pin type). Search and measure enable the user to distinguish surface moisture from sub-surface moisture, essential information when trying to establish the extent and cause of a moisture problem. Surveymaster is a moisture meter that displays the moisture level values on a digital display along side a scale of colour coded lights. 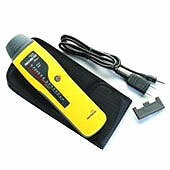 This digital moisture meter helps in accurate building material moisture measurement. This combined presentation of moisture measurement helps the user to map the extent of problems and monitor changes in condition precisely and reliably. 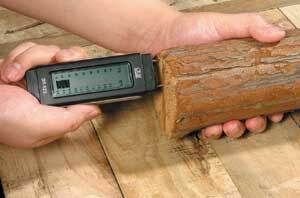 Dry rot detector - the best way to find 'active' dry rot, or to chart the edges of an attack. Dampness can be caused by common defects, like blocked gutters overflowing, poor pointing, cracked external render. For immediate help (in office hours) ring our dedicated team of Experts - we will help to diagnose your dampness problem FREE. Ring them on 01626 331351 or use our special CHECKLIST by clicking here.